Hi everyone! I’m from Texas but currently live in Germany and have been forced to go from eating processed food quite often to very, very rarely. Believe me, Germany has just as much processed food as North America, but when a recipe calls for graham crackers? Have to make them myself because they don’t exist. Recipes with pudding, Jell-o, or cake mixes? Can’t make those either because the mixes aren’t at all similar. I read a lot of blogs and I can’t tell you how many times I’ve commented, “I’d love to make this but we don’t have _________ in Germany!” So basically I’ve learned to make everything from scratch. There are so many cute Halloween recipes out there, but coming up with one with no processed ingredients wasn’t so simple. A lot of them use food dye or colorful, super-processed candy. I avoided all of that by making dip and putting it in something naturally colorful and festive. 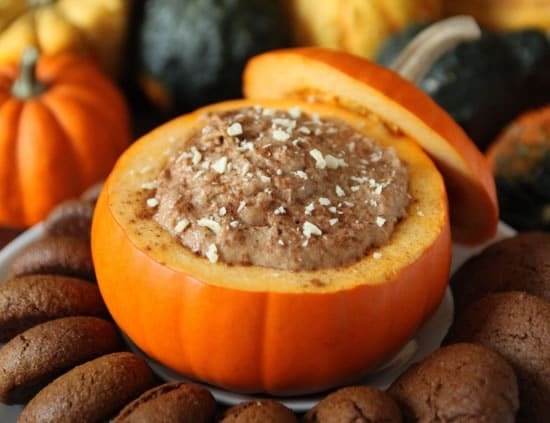 Most of the pumpkin dip recipes out there use loads of powdered sugar, which is something I usually try to avoid. My first attempt was a version using only maple syrup but it tasted way too bland. I love white chocolate and pumpkin together so I then tried using that. Perfect! And luckily, you can make honey sweetened white chocolate at home, meaning it counts as non-processed. Score! It only takes a few minutes to make this and stays good for several days in the fridge. I went a bit crazy with the spices because I like my goodies this time of year to scream fall. I just can’t do subtle. And even if someone doesn’t like white chocolate, I don’t think they’d mind it in this. It’s not overwhelming at all. I used these 100% whole grain ginger cookies with my pumpkin dip, but next time I’ll use something more neutral-tasting. Graham crackers or apples would be perfect! This makes a ton of dip but it’s easily halved. What you see above is only a fourth of the recipe. 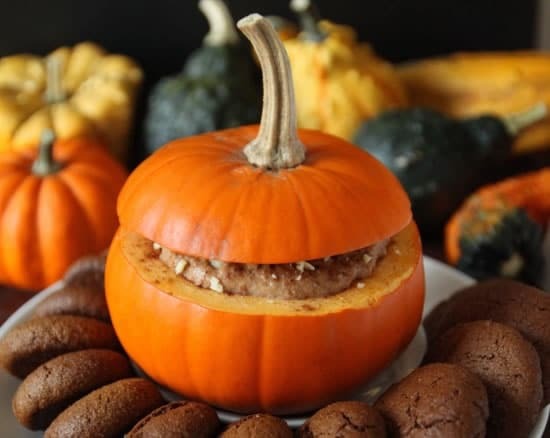 Perfect for when you have a little pumpkin left over and nothing to do with it. Yields about 4 cups of dip. With an electric mixer, beat together the canned pumpkin and cream cheese until thoroughly combined. Add all the spices but note that if you don't want the dip heavily spiced, only use half. You can always add the other half if desired. In a microwave-safe bowl, melt the chocolate chips on half power in 30 second increments, stirring after every increment until melted. Add the white chocolate to the pumpkin mixture and beat until combined. Taste and add maple syrup if you like. I didn't find it necessary but added some to see if it would affect the texture. It didn't affect it at all so add some if you like! Store in the fridge until serving. If you wish to garnish with cinnamon and white chocolate shavings, do so just before serving. Erin is the blogger behind Texanerin Baking, a blog which focuses on making healthier whole grain, reduced sugar recipes taste delicious, not healthy. She has visited 19 European countries and shares her love of travel with her husband – they met as exchange students in Sweden while in college! When she’s not baking or thinking about baking, she teaches English and does her best to avoid doing the dishes. You can also find her on Facebook, Twitter, and Pinterest. this sounds very yummy! Thank you for sharing. This recipe looks DELISH! Just a questio though– do you consider cream cheese as a processed product? Because all the cream cheese I have found in stores contain stabilizers, carrageanean, ect. It’s not exactly like cream cheese but darn close! This was delicious! Loved the spice and didn’t feel it needed any maple syrup either. Just perfect as is. I was eating it and saying “I love the smoothness of the dip paired with the crunchy apple.” My 3 year old said “Yes, its very scrunchie.” lol. Guess that’s what she calls smooth/crunchy. I’m so sorry for the slow reply, Heather! I’m so pleased to hear that you and your daughter enjoyed the dip and I love her “scrunchie” comment. 🙂 Thank you for leaving feedback and sorry again! How long does this last in the fridge? Thanks! This is amazing. It tastes just like cheesecake! And it’s great with apples. Thank you for sharing! !